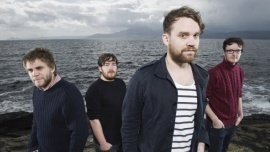 Frightened Rabbit is a Scottish indie rock band from Selkirk, Scottland that I cannot stop listening to. I think one the things I love so much about this band is that I get lost in their lyrics. There are so many songs that I go back and listen to just to try to figure out what they are really saying. One of the things I noticed right off the bat were the symbols they use in their album art as well as merch. Being someone who has been in love with symbols and symbolism his entire life, I geeked out a little. I got super excited and went to goolge to try to find the meaning behind the symbols. But the lead singer has confrmed that the symbols are meaningless. (Minus the fact that the are now associated with the band). I really love semi-minimal posters with flat colors and nice textures, I also love posters with black and white photography mixed with a splash of color. Andrio Abero some to mind as kind of a mixture of the two. Like I said before I'm a sucker for symbols so i also found some runes and symbols to look at.